A POS (point of sale) restaurant management system aids food & beverage operators in processing orders and maintaining financial control over their business, with the help of cash management and integrating with payment service providers. Some POS restaurant management systems are equipped with additional features for monitoring the ingredients inventory. From computer systems to management systems, an exponential growth has been witnessed in the restaurant software industry over the past few years. POS system is the first foray that restaurants have taken in the restaurant software space, enabling them in exchanging cash & credit, and consolidating sales data in a single storage. A number of next-generation POS restaurant management systems are providing tablets with restaurant ordering applications, real-time business analytics, and modules for integrated gift & loyalty cards. Demand for POS terminals has witnessed a significant rise in light of its multi-functionality benefits to restaurant owners, which in turn has driven the demand for POS restaurant management systems. The flexibility of POS systems, equipped with features including stock & inventory management, customer relationship management, and billing, help restaurant operators in making effective decisions and profitably carrying out their business operations. Transparency Market Research (TMR), in its recent report, has projected the global POS restaurant management systems market to exhibit a double-digit CAGR over the forecast period (2017-2026). Global revenues from POS restaurant management systems are poised to reach approximately US$ 30,000 Mn by 2026-end. Continuously expanding food service sector in countries of Asia-Pacific excluding Japan (APEJ), such as China and India, on the back of favorable demographic condition, is likely to proliferate demand for POS terminals in the region. In terms of revenues, the market for POS restaurant management systems will remain the most lucrative in Asia-Pacific excluding Japan (APEJ), closely followed by Europe. North America is also expected to be an attractive market for POS restaurant management systems, albeit projected to reflect a relatively lower CAGR through 2026. On the basis of type, mobile POS terminals will continue to dominate the POS restaurant management systems market in terms of revenues as well as CAGR through 2026. Rapid rise in popularity of wireless technology, coupled with constant reduction in prices of mobile devices has accelerated the adoption of mobile POS terminals by restaurant owners. In addition, Fixed POS terminals will also witness an impressive expansion in the market through 2026. Based on end-users, although full-service restaurants will continue to account for a slightly larger revenue share of the market, sales of POS restaurant management systems in quick-service restaurants are projected to witness a significantly higher CAGR than in full-service restaurants through 2026. The largest revenue share of the POS restaurant management systems market will be accounted by billing application in 2017. However, the market revenue share of delivery management will surpass that of billing by 2026-end. Revenues from sales of POS restaurant management systems for application in billing and delivery management will collectively exceed US$ 13,000 Mn by 2026-end. In terms of revenues, although hardware is expected to be the most attractive component of POS restaurant management systems in 2017, by 2026-end software platform will become the largest component segment in the market. Sales of software platform will witness the fastest expansion in the market through 2026, on the basis of component. Key players profiled by TMR’s report on the global POS restaurant management systems market include Ingenico Group, Verifone System, Lavu, POSist Technologies Pvt. Ltd., Ravel Systems POS, EPOS now, TouchBistro, AccuPOS, PAX Technology, and Clover. These market players are adhering to strategies such as partnership, acquisition, and research & development, with an aim to broaden their product portfolio. In April 2016, for example, Revel and Verifone entered into a partnership for simplifying & enhancing their payment management. Transparency Market Research (TMR) has published a new report on the global POS restaurant management systems market. The report analyses the market for POS restaurant management systems at a global scale, and has covered the market dynamics extensively, providing key trends impacting the market. This report on the global POS restaurant management systems market delivers an intrinsic knowledge base for leading players in the market, who seek expansion of their presence worldwide. Analysis delivered in the report is imperative for players and investors, at the time of gauging expansion potential of the global POS restaurant management systems market in the foreseeable future. The report commences with a chapter on executive summary of global market for POS restaurant management systems, which offers key research findings related to product and regional segments, along with significantly relevant market numbers. The historical CAGR (2012-2016) as well as the forecast CAGR (2017-2026) have been included in this chapter. The chapter also provides information about the lucrative regions for expansion of the global POS restaurant management systems market based on sales expansion rate and market revenue shares over the forecast period. A chapter on overview follows the executive summary of the global POS restaurant management systems market, delivering quick introduction of the market and formal definition of “POS restaurant management systems”, in turn implying report readers the scope of this market. Subsequent chapters in the report offer information on market dynamics including drivers, restraints, opportunities & trends impacting the market expansion. Analysis on raw material sourcing strategy, supply chain, and cost structure is also covered in the report. The report provides a segmentation-wise analysis on global POS restaurant management systems market. Segmentation of the market has been done in terms of types, component, end-user, application, and region. The chapter offering segmentation analysis includes imperative market numbers pertaining to year-on-year growth comparison, revenue comparison, and market share comparison. Geographically, the report categorizes the global POS restaurant management systems market into Latin America, North America, Europe, Middle East & Africa (MEA), Asia-Pacific excluding Japan (APEJ), and Japan. 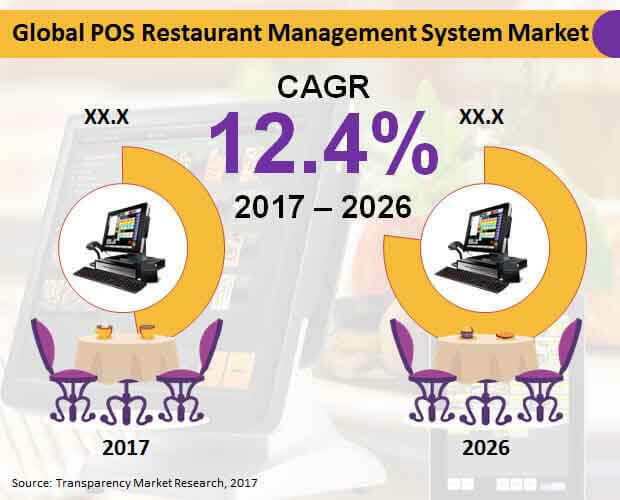 The report provides an intensity map, which plots presence of key participants in the global POS restaurant management systems market. The concluding chapter of the report offers insights about these market players, coupled with the information about the market’s competitive landscape. Analysing key market players exhaustively, the report has delivered information on SWOT analysis (strengths, weaknesses, opportunities, & threats), key financials, key developments, product overview, and company overview related to that particular company. The competitive landscape is extremely valuable for report readers, as it includes all necessary knowledge for analysing contribution of key players to expansion of the market. In addition, this chapter enables studying way of the market players’ strategy implementation, along with their aims of staying at the top of this highly competitive market. The report on the global POS restaurant management systems market follows an extensive research methodology that relies on both secondary and primary research for gleaning every necessary information associated with the market. The qualitative aspects gleaned from key opinion leaders and various industry experts have been adhered to during evaluation of the report. All the information collected is validated thoroughly by TMR’s analysts to deliver the most accurate market insights. Clients may use this information as an authoritative source while making their business decisions.